The Drill Down Reports in SSRS means allowing Users to Show or Hide the Column Data by providing plus and minus symbols on a text box (In short, Providing Interactivity to the Users). In this article, we will show you, How to Create Drill Down Reports in SSRS with an example. 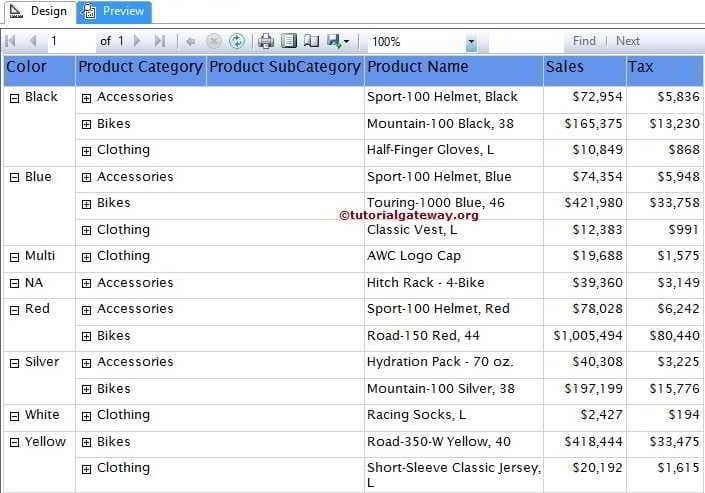 We are going to use the below-shown report to explain, How to create Drill Down Reports in SSRS. Please refer to SSRS Table Report, Data Source and Dataset articles to understand the creation of Data Source, Dataset and Table report. 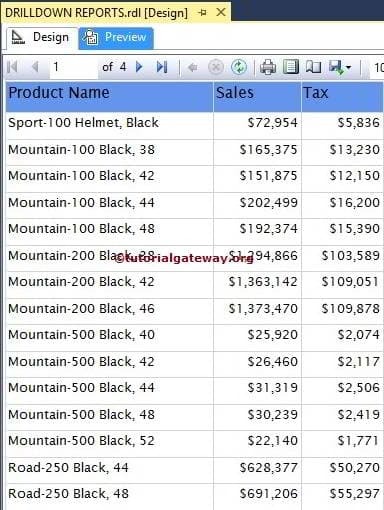 If you observe the below screenshot, It’s just a normal Table report with Product Name, Sales Amount and Tax Amount columns. 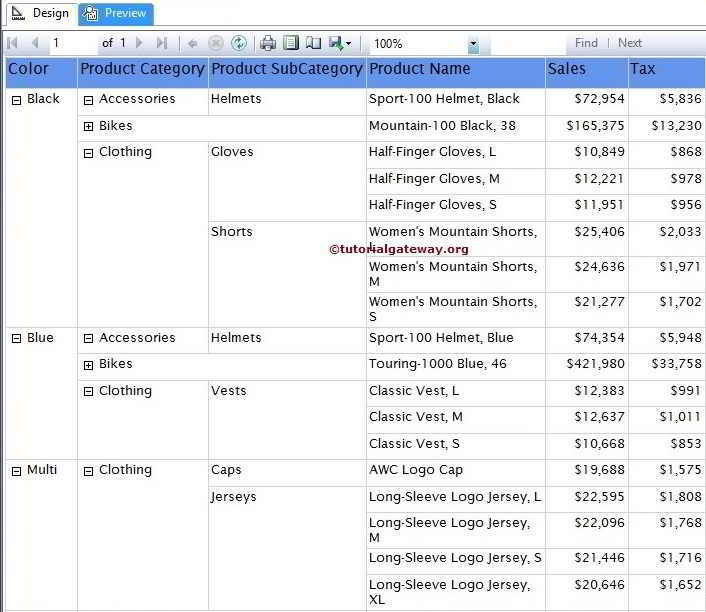 In this example, we will show you, step by step approach to create drill down reports in SSRS. Before we start enabling the SSRS Drill Down action, we have to group the columns using SSRS grouping technique. In our previous article, we already explained the grouping. 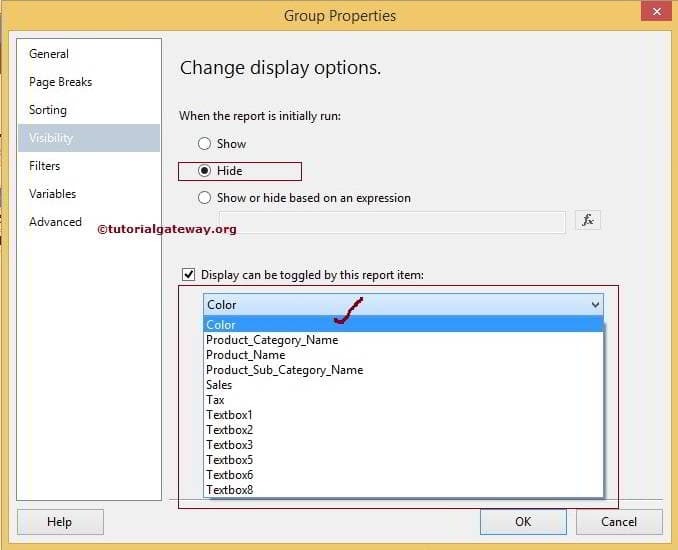 So, Please refer to Grouping in SSRS Table Reports article to understand the below-shown screenshot. If you observe the below screenshot, We applied the Row Grouping by Color as parent Group. Next, Product Category Column Name as Child Group and Product Sub Category Name as Product Category Child. To enable the SSRS Drill down action, first, go to Row groups pane and right-click on the Product Category Name will open the context menu. From the context, Please select Group Properties.. option as shown in below screenshot. 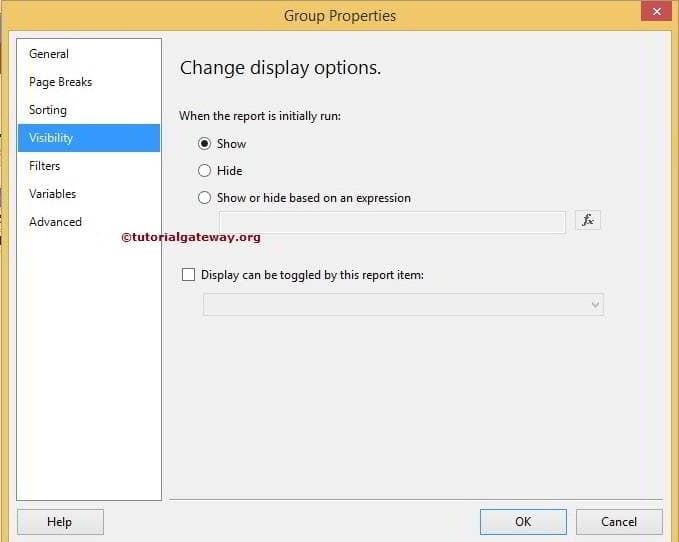 Once you select the Group Properties.. option, a new window will be opened to configure the Group Properties. Please select the Visibility tab on the left hand side. 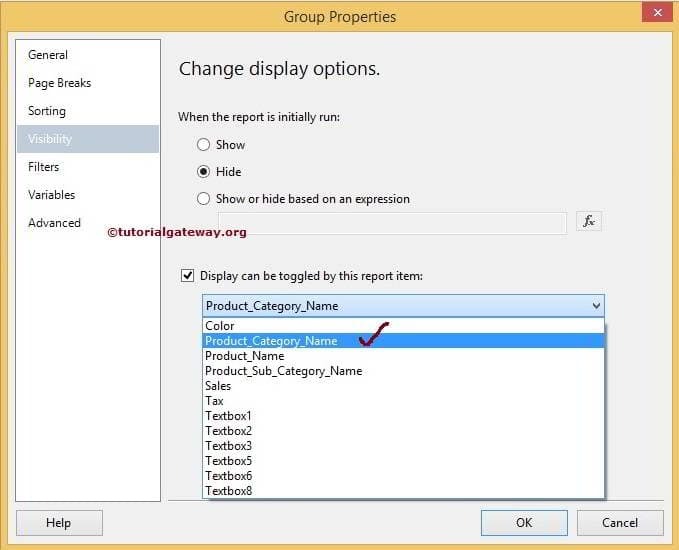 Hide: When you run the report initially, If you want to Hide the Product Category Name then select the Hide option. In this example, we want to hide the Product Category Name initially so we selected this option. Show or Hide based on an Expression: You can write your own expression to show / hide the Product Category Name by clicking fx button. Display can be toggle by this report time: If you select this option, Product Category Name will be show/hide based on the report item we selected here. In this example, we want to toggle the Product Category Name based the Color selected by the user. So, select the Color column from the list as shown below. 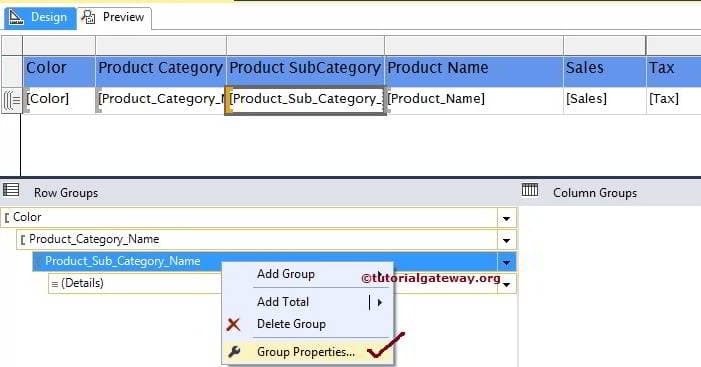 Within the Row groups pane, right-click on the Product Sub Category Name and select Group Properties.. option as shown in below screenshot. Here, we want to toggle the Product Sub Category Name based the Product Category Name selected by the user. So, select the Product Category Name column from the list as shown below. Here, + symbol before each color is the SSRS drill down action.